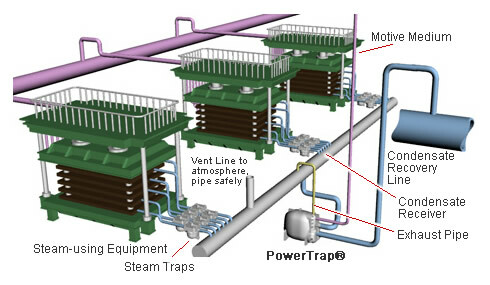 The PowerTrap® is a pump that transports condensate, powered by pressure from steam or compressed air without the use of electricity. It is ideal for use in open systems* which collect condensate from steam-using equipment for the purposes of recovering heat energy and recycling treated water. Optional cycle counter available to assist in monitoring pump cycles, scheduling maintenance, and estimating flow volume. Unique snap-action mechanism instantaneously opens or closes the motive medium inlet and exhaust valves. This prevents leakage of the motive medium and erosion of the valve/valve seat that tends to occur with crank mechanism pumps. Stainless steel internal parts and durable compression coil spring. Maintenance is possible without removal of piping. Fast and easy cleaning of intake valve, which is prone to scale build up, by simply opening a plug to remove (GP10). Stainless steel check valves for durability. Newly-developed high-capacity CK3MG and CKF3MG check valves (CKF3MG for flanged GP10). Improved durability, quiet operation and reduced return hammer after condensate discharge. Center-guided for maximum reliability, even with dirty condensate.